Wes Anderson’s latest film, Moonrise Kingdom, is now out in theaters! New York and Los Angeles saw their debuts last week, and nationwide roll out is just around the corner. San Francisco will see the debut of the film on Thursday, May 31st at the Metreon, help us spread the word and enter our official contest for a Moonrise Kingdom gift pack! To enter the contest, simply reblog this post on Tumblr for your chance to win an official Moonrise Kingdom gift pack, which includes shirts, patches, a canteen and a cooler! 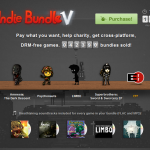 Five winners will be chosen at random. View all the prizes here. If you want to attend the free screening of Moonrise Kingdom at the Metreon in SF tomorrow (Thursday, May 31st) just shoot an email to MoonriseRSVP@gmail.com for free tickets! Tags: yeah I want to win stuff. Wanted to hold another contest for a while now to say thanks to everyone for following my blog/tumblr/twitter/etc! I really appreciate the feedback from you all. I promise to continue making things and I hope that you will keep looking at them! So here’s the deal for this contest: You can enter by leaving a comment on this blog post or liking this post on my tumblr. Make sure I can get in contact with you if you win via email! Contest open to everyone anywhere in the world but one entry per person please! Pretty easy, right? You can enter till Wednesday June 6 12:01 am E.S.T. Then I’ll hold a random draw to select the winner. 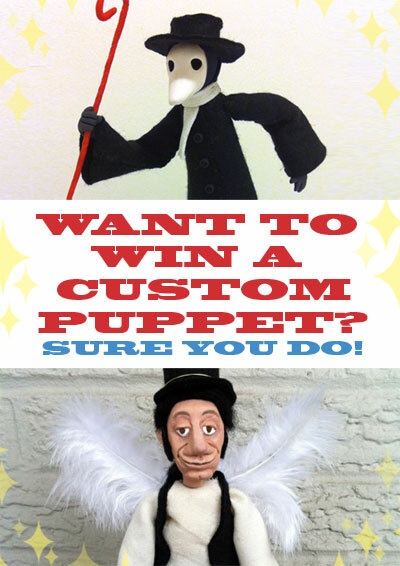 What the winner gets: A custom puppet of your choosing that I will make and mail to you! It can be an original character of your own, a celebrity, a character from a tv show, whatever you want! I’ll put my own creative spin on it and make it just for you. 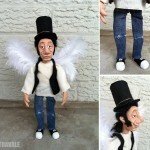 You just have to be able to supply me with some reference for me to base the puppet off of. I think that’s it! Good luck to everyone!